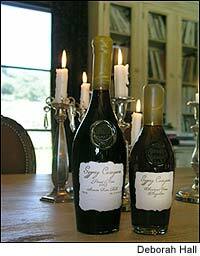 Gypsy Canyon's wines are bottled in hand-blown glass, with handmade paper labels and beeswax seals. The nooks and crannies of Santa Barbara County's remote canyons are inhabited by wild boar and mountain lions. Occasionally, these places also offer viticultural gems as untamed as the wildlife. When Deborah Hall and her late husband, William, fled the Los Angeles area for the wilds of the Santa Rita Hills, they had two goals. She wanted to make a home in the country, and he dreamed of growing Pinot Noir. After they bought their property in Gypsy Canyon, west of Buellton, in 1994, they discovered an abandoned vineyard that had been overgrown by brush and weeds. Once the site was cleared, Hall found gnarly old vines that had been unattended for decades. "No one knows exactly how old they are," said Hall, 49, a rangy woman who likes to hike through her property, which she shares with nine dogs and four horses. It's a good guess that the vines are roughly 125 years, but it's less clear who planted them. Nor at first did anyone know their makeup. Hall was told the grapes were Zinfandel and sold them as such for two years until, with help, she determined that they were the Old Mission variety, used for years to create sweet wines. Mission grapes were brought to California by Spanish missionaries and were once among the most widely planted grapes in the state because of their ability to produce long-lived sweet wines. Today, there are only about 750 acres of Mission grapes in California, according to state agricultural records. As part of her winemaking education, Hall studied old viticultural and winemaking books, including the originals used by the padres at the missions. One of the books, Agricultura General by Alonso de Herrera, dates to 1777, according to Hall. She has dedicated herself to following the Old World methods, even using notes from 1891 on how to make Angelica, the name historically used for the sweet Mission wine. It is thought to be named after the city of Los Angeles. Winery owner Deborah Hall believes her Old Mission vines are around 125 years old. Gypsy Canyon's non-vintage Angelica (87 points, $125/375ml, 44 cases) is delightfully rich and syrupy, with thick fig, earthy raisin, sage and apricot flavors that coat the palate. It comes from a 3-acre site (named Doña Marcelina's Vineyard after a pioneering woman who grew wine grapes in California in the early 1800s) with nearly 1,500 vines. After harvesting the grapes at 24 Brix, Hall ferments the wine to about 12 percent alcohol before adding a neutral grape spirit, which stops the fermentation at about 9 percent residual sugar and brings the alcohol to 18 percent. The wine is fermented in half-filled neutral barrels for two years, allowing for a slow oxidative process. Eventually, it turns a brilliant amber color. Hall's Pinot Noir vineyard was planted in 1999, after her husband's death from cancer at the age of 47. She uses a combination of traditional and modern methods to farm the 4-acre site and to make the wines. The grapes are picked early in the morning, cold soaked and punched down for two to three days in small plastic bins before going into new and used French oak for 11 months. The 2004 Pinot Noir (88, $75, 71 cases) offers fragrant lavender scents with a medley of rich, exotic huckleberry and wild berry flavors that are vivid and persistent. It is fermented with a tiny amount of Pinot Gris. To add to the historic feel of her wines, Hall puts them both in handblown bottles made from recycled glass, with labels produced from handmade recycled paper and printed on an antique press. The corks are sealed with beeswax harvested from her property. The wines are hard to find and only available at a handful of places in California. They can be obtained by joining the customer list at www.gypsycanyon.com or by calling (805) 737-0204. For Hall, life as a winegrower allows her to achieve the kind of balance between old and new, tradition and innovation, that is so essential to her lifestyle and values. "When we moved here, we weren't sure how things would turn out," she said. She has been able to overcome her husband's untimely death and find an equilibrium between living off the land and appreciating its intrinsic beauty. In that way, she pays the land her respect.